GME has been working with the water users of Grand Isle since 1991. The original Preliminary Engineering Report was conducted for the Grand Isle Fire District No. 3, which has since merged with the G.I.F.D. #1 and G.I.F.D. #2 to form the GICWD. The current system, built in three phases, now consists of a Lake Champlain Intake, a 356,000 gpd Kinetico™ Filtration System (selected for use following a successful Pilot Study by GME), over 100,000 feet of distribution lines, a 300,000 gallon storage tank, and water meters for each user. 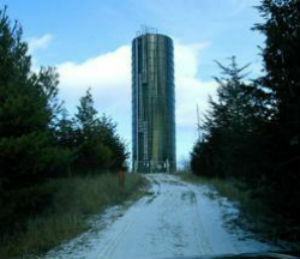 A second, 132,900 gallon storage tank was constructed in 2003. A project for the Bell Hill Tank Bypass and Emergency Connection to G.I.F.D. #4 was constructed in 2007. GME was contracted in 2009 to complete a comprehensive subsurface data collection, integration and mapping study. The information collected during the mapping study has been used to create a WaterCAD® model of the system. Most recently, GME provided Preliminary, Final Design, and Construction Phase engineering for addition of a Granular Activated Carbon filtration system for reduction of Disinfection By-Products. GME provided site design and permitting services for the first of its kind compressor station in the United States, which began operation in March of 2013. The company purchases natural gas from a pipeline operator, compresses the gas in special trailers, and hauls them to customer sites. The gas is used directly from the trailers eliminating the need for on-site storage. GME worked with the Greater Burlington Industrial Corporation and the Town of Milton to secure local and state permits including ACT 250, Stormwater, and water and wastewater permits. 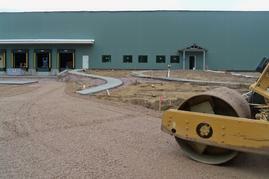 GME has also provided site design and permitting at many of NG Advantage's customer sites in Vermont and New Hampshire. GME has been working with the Town of Bristol since 1992. In 2005, we assisted with a waterline replacement project, replacing 2,817 linear feet of existing 4-inch waterline with a new 8-inch ductile iron water main on Pine Street, North Street and Plank Road. New service connections and water shut-offs for all users were supplied. 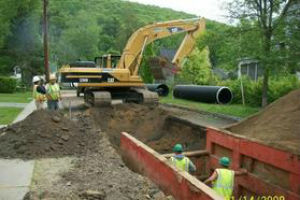 In 2009, we assisted the town with utilizing ARRA funding for the removal and replacement of approximately 3,200 linear feet of existing storm drain and appurtenances, a partial re-grading of North Street, implementation of curb and gutter, and approximately 2,000 linear feet of water main replacement. Construction Contract Documents, Bid Phase Services, and Resident Inspection services have all been provided. 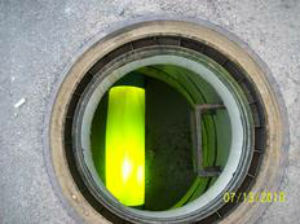 Most recently, we completed an evaluation of subsurface utilities for the former Village of Bristol. We created maps of the stormwater drains and water and sewer system in the Town, necessary as a planning tool for determining the adequacy of culverts being replaced with money allocated from the State of Vermont. The project included data collection, engineering evaluation and a final report for municipal officials, providing a prioritized matrix of segments of subsurface utilities to be repaired or replaced with opinions of probable construction costs and potential sources of funding identified. 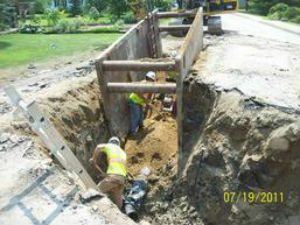 GME has been assisting the Town of Richmond with engineering services since 1995. In 2005, GME successfully completed research and evaluation of all subsurface infrastructures to address necessary upgrade and/or replacement. In 2009, we assisted the Town with utilizing ARRA funding to begin addressing improvements detailed in that Report: a stormwater upgrade on Millet Street and Tilden Avenue, and a Sewer Lining and Renovations project on Depot Street to improve the condition of the existing sanitary system. Warehouse & Connector - Autumn Harp, Inc.
GME provided site design and permitting services for a 57,600 square foot warehouse on a 4.18 acre parcel located in Essex Junction, VT within Forestdale Technology Park. 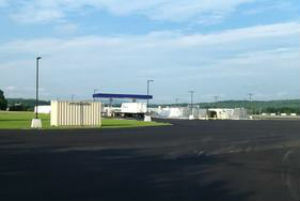 The site design allowed for a connector to Autumn Harps existing adjacent facility allowing for efficient movement of raw materials and product under "one roof". GME's permitting services included local and State permits including ACT 250, Stormwater, and water and wastewater permits. Construction was completed by Neagley & Chase Construction in Spring 2013. GME has been assisting the Town of Middlebury with several projects since 2006, providing engineering, design and construction phase services for infrastructure improvements. The Buttolph Drive and Stewart Lane projects include installation of water main and appurtenances, rehabilitation of sewer manholes, cleaning and television inspection of sewer main, and installation of water mains, services and storm sewer and sump pump service connections. The Rolling Acres project consists of upgrading an existing 2-inch waterline to 8-inch, connecting current users via saddles, corporation stops and connection to the existing water services.